Cool Bed III is the cooling, cushioning, waveless waterbed for your pet. Does not require any batteries or electricity. Simply add the recommended amount of water through the easy fill cap and burp with the new easy air adjustment valve. It's designed to radiate heat back into the air or the floor surface to keep pets cool. Cool bed III is the choice for any dog owner looking to offer their pet a comfy, dry, cool place to relax. Hot diggity dog! The "Award Winning" Cool Bed III. The readers of Pet Business Magazine have voted and from over 250 manufactures and thousands of beds, they voted the Cool Bed III as the best bed for 2007. The Cool Beds offer a unique selling opportunity during the otherwise slow selling months of summer. When the days are hot, and sales are not, the Cool Bed out sells them all. 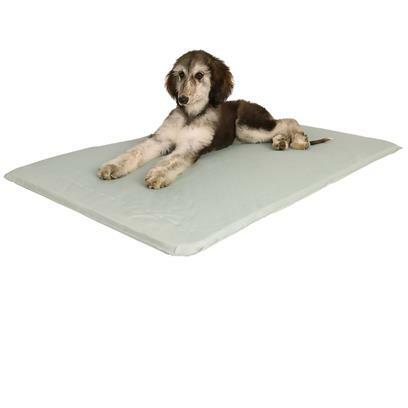 cool bed 3, coolbed3, coolbed lll, 111, iii Aids in: Medical recovery Skin conditions Calloused elbows Arthritis Excessive panting Hip dysplasia Size Recommended for Small: (17" x 24") dogs up to 25 lbs Medium: (22" x 32") dogs up to 60 lbs Large: (32" x 44") dogs over 60 lbs Only ground delivery available. Please allow 7 to 12 days for your delivery to arrive.